We take great pride in the achievements and success of our alumni! We welcome alumni to share their successes, career changes and promotions, business and community recognitions, company awards, marriages, birth announcements, and other news of interest. Kathleen (Ciraulo) Sotakk '71 shared that she and her husband met while attending Pitt-Greensburg and have many happy memories of the school. Robert M. Miller Jr., Esq. '74 retired after serving 36 years years as an attorney for the Commonwealth of Pennsylvania. Christopher J. Luccy, D.M.D., ’70 announced his retirement from private practice. And, after serving 40 years at Children's Hospital of Pittsburgh, he was recently named to the Honorary Medical Staff. Susanne (Miller) Diemert '85 established Shining Star Therapy LLC, a small private practice for outpatient mental health with a focus on Medicare members. David Yurkovich '86, Mark Polo, Bayne Northern and Dianne Pearce founded Devil's Party Press(DPP) of Milton (Delaware) in 2017. He serves as DPP's managing editor, and unveiled the publishing company's road map for the remainder of 2018 which included two original novels, and three anthologies. Recently, DPP captured two awards in the Delaware Press Association's 41st annual Communications Contest Awards Banquet, held May 3, 2018, at the University & Whist Club in Wilmington. Halloween Party 2017, the publisher's debut release from October 2017, took 3rd place in the "Short Stories - Collection" category, while its sophomore title Solstice captured 2nd place in the same category. He also published original prose and sequential fiction. Gregory Turley ’87 has been selected to lead one of Westinghouse’s key initiatives in expansion as the Director of Field Operations and Non-Nuclear Growth. This is a global initiative that cross cuts all of Westinghouse’s business segments. He has formed an incubation team comprised of the best and most creative strategic minds. As a team, they are responsible to recommend new, breakthrough businesses to the executive staff. Linda S. Welker '91 retired from government work in January 2018. She is currently enrolled at IUP in the Masters of Busness Education. Her goal is to obtain a teaching certification to teach business topics in high schools or community college. Richard Parfitt '96 assumed the position of Director of Safety and Security for the School District of Lee County in Florida. Dr. James Taylor '91 received a PhD from the University of South Florida in Leadership, Counseling, Adult, Career, and Higher Education with a dissertation topic on Entrepreneurship Education in December 2017. Dr Taylor is a faculty member in the University of South Florida Center for Entrepreneurship, and President of Oakford Park Capital. Troy Ross ’99 and his wife, Jessie, announce the arrival of Charlie Rae Ross on June 14, 2016. Sherry Magretti Hamilton ’99 took office in January 2016 after being elected Westmoreland County Register of Wills & Clerk of the Orphans' Court. She formerly served as Hempfield Township Supervisor. Michel (Bratkovich) Keller ’96 shared a photo of her family. Frank Spoto Jr. ’99 joined The Baltimore Life Companies. He works with individuals and small businesses in foundational planning. Bill Viola ’99 recently published Godfathers of MMA. The book is the inspiration of the documentary Tough Guys which was filmed in Pittsburgh earlier this year. Bill is the producer of the Pittsburgh Fitness Expo and founder of Kumite Classic Entertainment Corp. 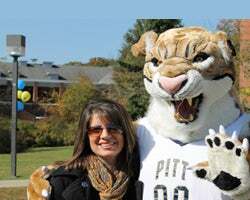 He is married to Pitt-Greensburg alumna Jenn (Beaver) Viola ’01. Jaime (Prinkey) McSweeny '05 was married to David McSweeny in 2017. They recently celebrated one year married. Jennifer (Keenan) Doerrman '05 was married on September 19, 2018. She says it was "the happiest and best day of our lives." Tera Yingling '03 was married on December 30, 2017 to Joseph Gera of Latrobe, PA. After earning her degree, she worked as a Pharmaceutical Project Manager at a contract testing laboratory until 2006. She then received a Master of Physician Assistant Sciences in 2008 from St. Francis University. Since then, she has worked as a family practice Physician Assistant at the New Paris Rural Health Clinic in Bedford County. Chad Eric Smith '08, the PGAA's 2017 Young Alumni Leadership Award recipient, was presented with the 2018 Rosebud Award for Best DMV (DC, Maryland, Virginia) Film for his short sci-fi drama Rumination at the Rosebud Film Festival, which was open to entrants worldwide. Rumination was shown on February 10, 2018 at the Boston Sci-Fi Film Festival. Rumination was acreened at the annual Pittsburgh Independent Film Festival on June 23, 2018 at the Fr. Ryan Arts Center in McKees Rocks, PA.
Brian Root '04 recently began his term as President of the Pennsylvania College Personnel Association (PCPA). PCPA is the state chapter of ACPA, the leading comprehensive student affairs association for higher education professionals who work in student affairs. His term began June 1, 2017 and will commence at the end of the administrative year. Sean O'Donnell '02 and his wife, Maddie, welcomed son Adlai William O'Donnell on June 28, 2017. Carrie (Smith) Wittig '06 married Corey Wittig on June 25, 2016, at the Union Project in Pittsburgh, Pennsylvania. Corey is the Lead Digital Learning Librarian at the Carnegie Library of Pittsburgh and manages the maker-based program called The Labs. Carrie recently accepted the position of Middle School Language Arts Teacher at Falk Laboratory School, the University of Pittsburgh's K-8 progressive school. Megan (Byers) Hinch ’03 welcomed her second daughter, Audrey, in April 2016. Her big sister, Lillian (3), is enjoying all of the fun that comes along with a newborn! Megan (Walsh) Paull ’07 and her husband, Brian, welcomed their first baby! Mason Joseph Paull was born on April 6, 2016, at 2:42 am. He weighed 7 lb 4 oz and was 20.8 in long. Kristen Davis ’08 is the public relations and communications specialist and homeless liaison for a school district in the Pittsburgh area. Leslie (Long) Fink ’09 is an auditor with Zelenkofske Axelrod LLC. Emily Bilik '13 welcomed daughter Lilian on June 6, 2017. Emily is also currently the District Recruiting Specialist for the Dillons division of Kroger in Kansas. Sarah (Fitzpatrick) Menzler '10 and husband Bob welcomed Connor James Menzler on February 12, 2018. He was 6lbs. 11 oz. and 29.5 inches long. He joins big sister Teegan, who is 3. Kevin Scrima '15 graduated witha Master's of Science degree in Information Technology from the Florida Institute of Technology in July 2018. Dr. Lauren (Ameris) Lanzino '10 married Gino Lanzino on May 27, 2017. She earned her Doctorate of Chiropractic degree from Palmer College of Chiropractic in 2013. She is now a licensed Pennsylvania chiropractor, and she is the Department Chair of Health and Science, and Assistant Professor at La Roche College. Dr. Kendra Custer Hornick '13 graduated from the West Virginia University School of Dentistry on May 12, 2018. She will be practicing in her hometown of Somerset, PA.
Samantha Ennis Fitzhenry '14 is proud to announce the birth of her son Nicholas Daniel Fitzhenry, who was born on January 10, 2018. Samantha says he's a "future Bobcat in the making." Natalee Forsythe Bright '15 was married on August 5, 2017 after 4 1/2 years of dating. She and her husband had their pictures taken at Pitt-Greensburg. Alexis Hackman '13 married Tyrel (Top) Korth on July 8, 2017. JP Hilzendeger '12 and wife Julie are proud to announce the birth of their daughter, Karen Marie, on June 15, 2017. JP and his wife are loving every minute of their time with their sweet little girl. Thankfully, their son Michael (2) is slowly learning to be more gentle with his baby sister. They are having a blast as a family of four -- learning a lot and growing together. Brianna Braden '14 and Joshua Karadeema are proud to announce the birth of their son, Eric Michael, on December 27, 2016. Eric was 7 lbs 7 oz and 20-1/4 in at birth. Brianna reports that the family is doing well and that they enjoy watching Eric grow. Samantha (Sinay) Zecchini '10 and her husband, Anthony, welcomed Luca Mario Zecchini on June 22, 2016. Emily Johnston '15 currently works at the Westmoreland County Community College Youngwood Campus as an events specialist in Event Services and assists the director of Event and Conference Services. Scott Szypulski '14 was promoted to Financial Research Administrator for the University of Pittsburgh's Department of Critical Care Medicine in April 2016. Rebecca Bergee ’14 is a Peace Corps Volunteer currently serving in Ghana, West Africa. She began her training in June of 2015 in-country and was sworn in as a volunteer in August. Read more about Rebecca's experience!